Bandicut Video Cutter is the best product to format your favorite videos. This software can trim videos for you at superfast speed. Now you can remove any part of the video like commercial or trailers with this easiest to use the software. If you have not yet found a perfect video tool to edit your search ends here. Bandicut Video Cutter makes the best software to manage your videos. So check it out and discover all the good it holds now! Let us have a detailed review of Bandicut Video Cutter features and find out what it can do for you. The best thing about this software is that it maintains the original video quality. You can cut, or merge your video as you wish. The app also allows you to split a video without affecting the quality in any way. 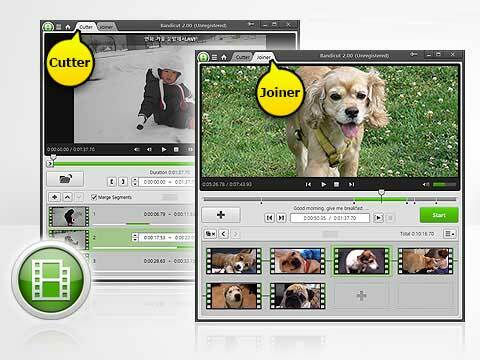 Bandicut Video Cutter is so easy to use that you do not need any special training to use it. You can select the area you want to remove and can merge apart from another video with great ease. Bandicut Video cutter allows you to format high-speed videos. You can cut, or join your videos. The app also helps you carry out other editing options such as merge, crop and more. Thus those who are quality conscious can count on this tool and enjoy superb quality without spending anything at all. Bandicut Video Cutter is not limited to specific formats. It supports almost all kinds of formats like avi, mp4, mov, and more. With such a wide range of formats, you do not have to install any software for different formats. While cutting, merging or splitting the video, Bandicut Video Cutter never edits the original video. It creates a new file where you can do whatever you want to do with the video. In that way, you never lose your original video. So download Bandicut Video Cutter and start editing your favorite videos in any way you like now! Bandicut is super-fast video cuttingjoining software with an easy-to-use interface.It allows users to trim parts of video quickly while keeping the original video quality.Users can also extract audio from video to MP3 join multiple video files remove one or more parts from the video or split the video into multiple files.The cuttingjoining area can be selected per frame which allows the user to precisely choose the cuttingjoining area.Other software cuts quickly only between keyframes. However Bandicut is able to cut quickly between any frames that the user selects.Bandicut supports two cutting methods High-Speed mode and Encoding mode. High-speed mode allows the user to cut a video precisely without re-encoding as a result the quality is lossless and the cutting speed is faster than any other software.Encoding mode allows re-encoding if the user wishes to change the codec resolution or quality of a video according to their needs.The user can save the video as an AVI or MP4 file.Bandicut supports common codecs such as H.264 Xvid MPEG-1 and Motion JPEG and various video formats such as *.avi *.mp4 *.mov *.m4v *.mkv *.mpeg *.mpg *.dat *.vob *.flv *.asf *.wmv *.ts *.tp *.trp *.mpe *.mpv2 *.mp2v *.m2t *.m2ts *.k3g *.divx *.wm *.wmx *.wvx *.rm *.rmvb *.ram *.ivf *.ogm *.vp6 and *.xvd.Bandicut also supports hardware acceleration using Intel Quick Sync Video provided your CPU has this functionality. It will allow users to cut videos at high speed with excellent and lossless quality.